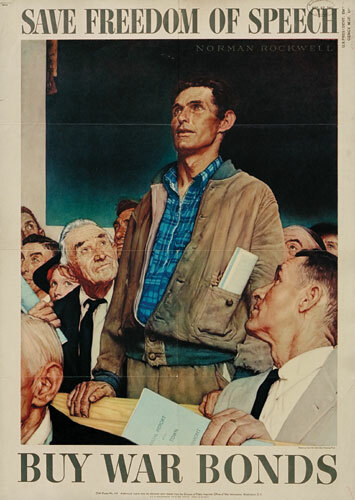 Although Norman Rockwell was not liked very much by the art critics, he was enormously popular. His work was far too sentimental to be critically acclaimed. However, as a draftsman he was quite skilled, and he was very adept at using small details to get his point accross. The first freedom was the freedom from want. 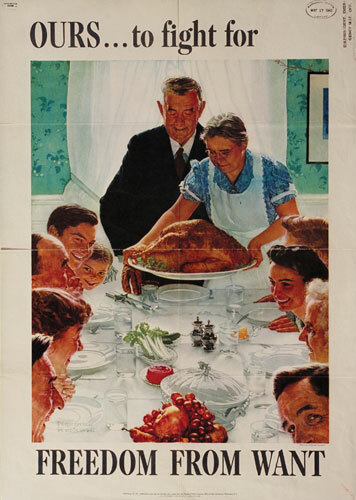 This poster became the most famous and was also known as “The Thanksgiving painting.” Notice how he draws the observer into the painting by having the man in the lower right corner looking back outside the painting at you, thus placing the observer in the family gathered around the table. 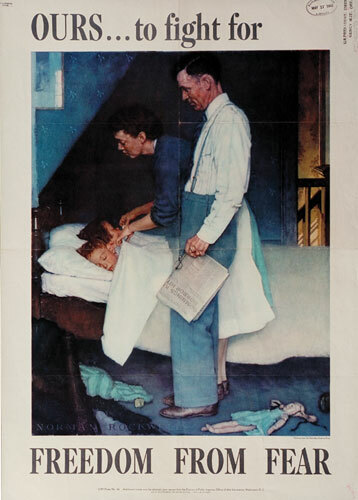 As a poster (not in the original painting), this painting is being used to encourage enlistment and support of the military. Another freedom was freedom of worship. 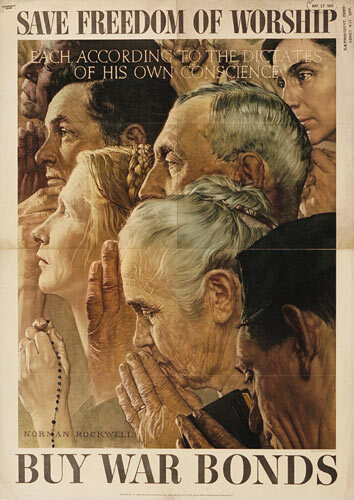 Notice the inclusion of the German-looking woman who is obviously Roman Catholic, since she is praying the rosary. This one also includes an African-American. A third freedom was freedom from fear. Mom and dad tucking the kids into bed– and yes, siblings shared beds and bedrooms all the time in those days, even though this is a two-story house. And a final freedom was freedom of speech. As the link explained this was based on a real incident at a school board meeting in the town where Rockwell was staying. The man speaking was opposed by almost everyone in the room in what he proposed, but they still respected his right to speak. And class distinction does’t matter– he’s in work clothes, while nearly everyone else is in a suit and tie. Those were the days! Notice how three of these paintings were turned into posters to encourage buying war bonds.